Four of the key players in staging the Legacy Banquet (from left) George Cotton, executive director of FAMU Foundation; Rev. R.B. 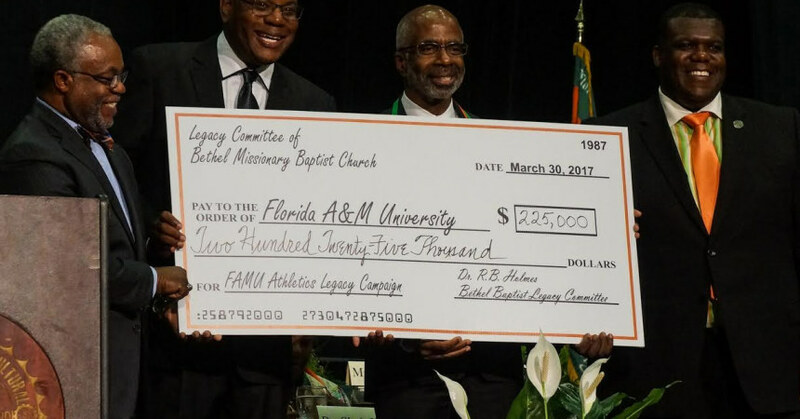 Holmes; Larry Robinson, FAMU’s interim president; and athletic director Milton Overton shows the proof of money raised by the event. The vision was pretty straightforward: Put together a banquet with a price tag of $100 per person and hopefully the event will raise some significant cash to help FAMU’s athletic department. What transpired from the idea that Rev. R. B. Holmes brought to the table was an event that drew an audience of unprecedented magnitude. As a result of the turnout of over 700 that packed into the Lawson Center for the event, $225,000 was raised to double the goal that came along with the idea. “Dr. Holmes’ vision has been realized,” said Larry Robinson, FAMU’s interim president. “This is a very good deal, Rev. Holmes. A very good deal. The fund-raiser was right on time, said athletic director Milton Overton, as it will be used to start the renovation of Bragg Stadium. The attraction of the event was the recognition of 15 individuals with ties to FAMU. Each of them was presented a medallion during a surprisingly fast-paced ceremony. FAMU’s Marching 100 also made an appearance, along with featured vocal performances by Carmen Cummings and Cassandra Poole. Two of the honorees — staunch supporters of their alma mater Eddie Jackson and Tommy Mitchell — attend McAllister’s church. As part of his effort to make the event far-reaching, Holmes called upon McAllister and other members of the Tallahassee clergy to seek support from their congregations. Holmes also invited several community and business leaders to a luncheon, which raised over $53,000 weeks before the event. “We knew we have a network of community leaders who love FAMU,” Holmes said. “Anytime we can help the football or basketball teams, we are going to do that. 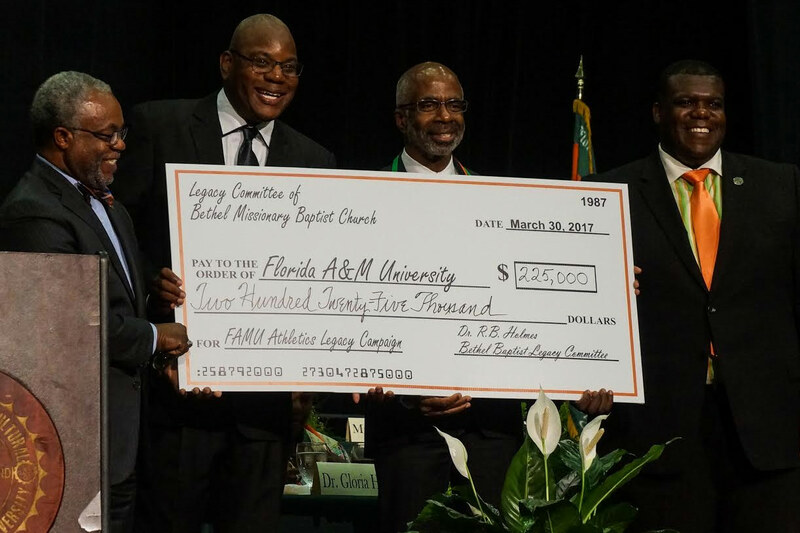 It was the second time since 2015 that Holmes worked with the FAMU Foundation to stage a fund-raising banquet. More than 500 showed up then, but even with the increased turnout this year, Holmes hedged on saying whether a similar fund-raiser will take place next year. Meanwhile, Mitchell who is a former president of FAMU’s National Alumni Association, said the success should spur more giving from alums. Especially those who might be on the fence about giving. “Nobody gets up and say who can I give some money to,” he said. “What this represents is that we ask. We have 7,000 graduates and we are going to ask them all. Overton suggested that the legacy event should continue.